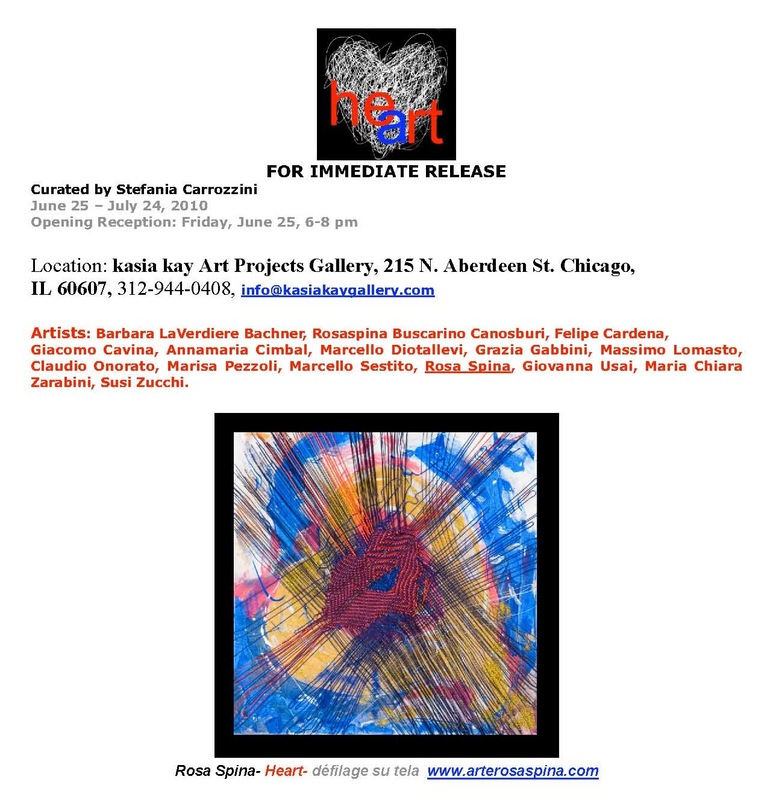 kasia kay art projects gallery is pleased to announce HEART, an international exhibition curated by Stefania Carrozzini. It opens on June 25, 2010 and features fifteen artists mostly based in Italy. It is a travelling exhibition and was on view at Onishi Gallery in New York in December 2009. The heart is the centre of our being. The West has made it into the origin of our feelings, of passion, quite the opposite of traditional cultures which placed there intelligence and intuition, therein dwells the soul. (…) Its movements (systoles and diastoles) make it also the symbol of the double movement of expansion and re- absorption of the universe. Over time, a tripartite form has been structured, a simple and complex code which belongs to the universal alphabet. At the base, a triangle with above it two circles. The heart is red and white, a flow of arterial and venous blood, it has the colors of life, and it brings together races, origins, religions and different cultures. With our heart open or closed, wearing our heart on our sleeve, we go in search of or we shut out relationships. There are the reasons of the heart, there is the fetish heart with its stereotyped iconography, an image worn thin by too much rhetoric, which only artists know how to transform, a “Warholian” Pop heart, merchandised, inflated, that of simplistic romantic literature, and of sentimentalism. Artistic creation is however a vital necessity, art is the heart of life, a centre of propulsion which eliminates all borders and diversity. Art is the fire which transforms, creates and destroys and this process happens in the heart of the void, or rather in the spirit, because in the apparent void there is a pulsing energy, an eternal energy, one which never dies out. One can give a vision to absence by means of matter as did Yves Klein, and through the experience of the void feel the racing heart of life which is a spiritual experience. Artists create never-ending worlds in space and time and they draw energy from the immaterial, in which everything already exists and is continuously recreated. Symbols, enigmas and messages flow in and out of the heart, chaos becomes order and order is a part of chaos. As a symbol it offers a transcendental reality which is also that of the mystic, of the prophet, of the artist. The exhibition of photographs, installation, paintings, sculptures, and collages will be on view until July 24th.